About seven years ago, I started to write sketches of my Father’s family history (including my brothers and sisters) and short biographies of each of his children. As I was the only surviving child of a large family of eleven children, it seemed to me that God had lengthened out my life and health for a purpose and had given me a family to train up in the way they should go, both by example and precept, and the six children who are living might prize a work of this kind from the brain and pen of their aged Father as one of his last acts of kindness that would remain with his children when his body is laid to rest in the silent grave. I have to write under some disadvantages as some of the events I shall narrate took place many years before I was born and I got the facts orally from my Parents more than sixty years ago and stored them in my memory. My parents are dead over fifty years. As to the age of my grandparents, I had to suppose or guess their ages. I had my parents’ age in a family record and that of all their children. I left my first family home at the age of twenty-nine years. 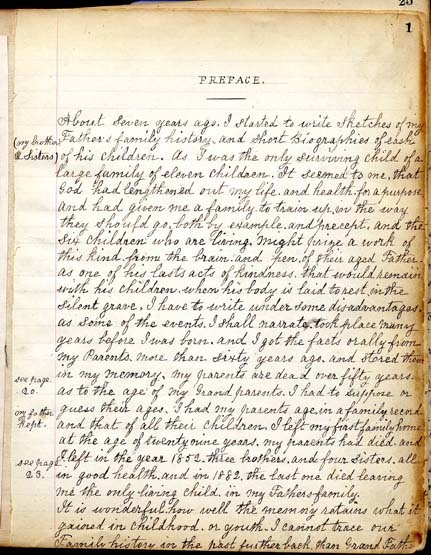 My parents had died and I left in the year 1852 [leaving] three brothers and four sisters all in good health and in 1882 the last one died leaving me the only living child in my Father’s family. It is wonderful how well the memory retains what it gained in childhood or youth. I cannot trace our Family history in the past further back than Grandfather. As a strong inducement for me to undertake such a task now in my old age, my children have given me tangible proof of their sincerity in supplying me with blank books for me to write a copy for each of them (providing the task was not too much for my strength) as they would preserve it carefully as a lasting souvenir of my many acts of paternal kindness to my family. I make no promises as the future is all hid from me. My life and times are in the hands of my Heavenly Father. I have four blank books to fill; not a bad year’s work for me to do. “I may die in the harness” and some of my children may complete the task. I feel better to be employed at something that may benefit those I shall leave behind. If I have blank pages to spare, I will give a short sketch of my mother’s family (the Langfords) and the mothers of my children (the Walden and the Stewart families). They well deserve a page in this book of chronicles. If these biographies and narratives and reviews give my children or grandchildren or reader of these pages the pleasure they have given the writer, I will be amply rewarded. I pray that God may preserve me in health to finish this volume which I will cheerfully present to my son Dr. C. W. Thompson of Clinton and his family to improve on a new edition. I have written this introduction on Saturday the Sixth day of May, 1905. May Almighty God bless this last effort of your aged Father and Grandfather! Amen! This entry was posted on October 9, 2013 at 3:40 pm and is filed under Book Design, Books, Genealogy, Writing. You can subscribe via RSS 2.0 feed to this post's comments. Thought you’d like the last version “PREFACE”… now on two pages! and under a deep sense of his many imperfections. go both by example and Precept. placed the dates as correct as possible. Insane – and about half that time he was mentally weak. pen in my hand, some one will finish the task. wife’s family, the Stewart Family. one died, leaving me the only living child of my Parents. it to my youngest daughter M. Gertrude Thompson St.
1916 to 1948 – Gertrude Pringle entered some BMD dates. “Lives of some of the Apostles”. and she returned it to the family in October 1998.
oh.. yes… both prefaces on two pages.. It does indeed seem that Joshua complete six copies for his children, and perhaps a master for himself, totalling seven. Makes one wonder about the fate of the rest. It could also make for an interesting comparative project down the road. Thank you so much for sharing and comparing the ‘Gertrude’ preface!